It takes time to find the correct lock or latch for your door handles, but once you have narrowed down the options, you will most likely be choosing between lever handles or door knobs. Additionally once you have decided the on the finish, you will be ready to choose the desired locks and latches. Door furniture is an important part of your house so to ensure your doors are looking their best as well as functioning efficiently, it is essential to that the correct locks and latches are chosen. This is highlighted by the fact that the majority of locks and latches have actually been designed with lever handles or door knobs in mind, not both. It is also important to consider what you will want to use on your doors when choosing the doors themselves, as some lovely modern door designs are unfortunately not practical if you want to use door knobs. The 2 main lock and latch case depths available for lever handles are 64mm (2 ½”) and 76mm (3”) which are perfect for lever handles which sit towards the edge of the door. 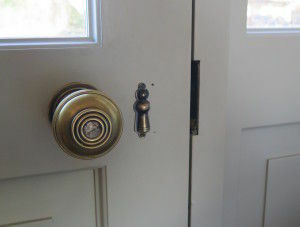 Most door knobs will physically fit on these locks too, however depending on the diameter you can be left with very little space between the door frame and the edge of the door knob to accommodate your knuckles. The result (as many have experienced) is the occasional or frequent pain of catching your knuckles on the door frame as you open and close the door! 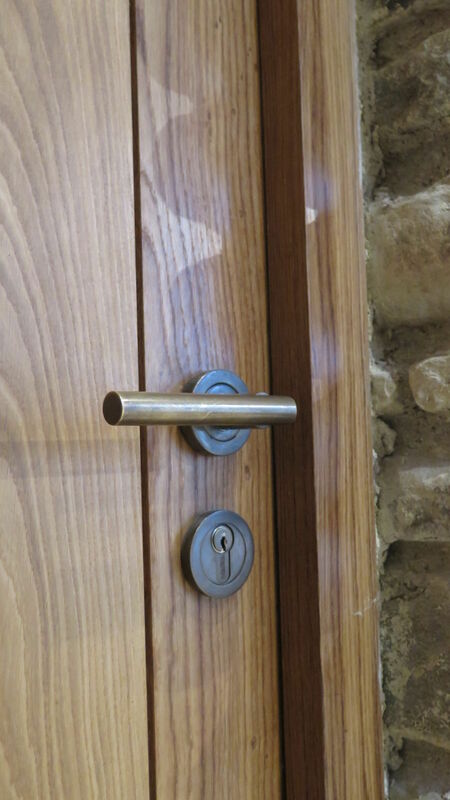 On locks suitable for lever handles, the keyhole, cylinder and bathroom turn will sit directly below the lever handle. These are known as 'vertical'. The 3 main lock and latch case depths available for door knobs are 102mm (4”), 125mm (5”) and 152mm (6”). With these depths, the door knob sits comfortably away from the door edge eliminating the risk that you will catch your knuckles. 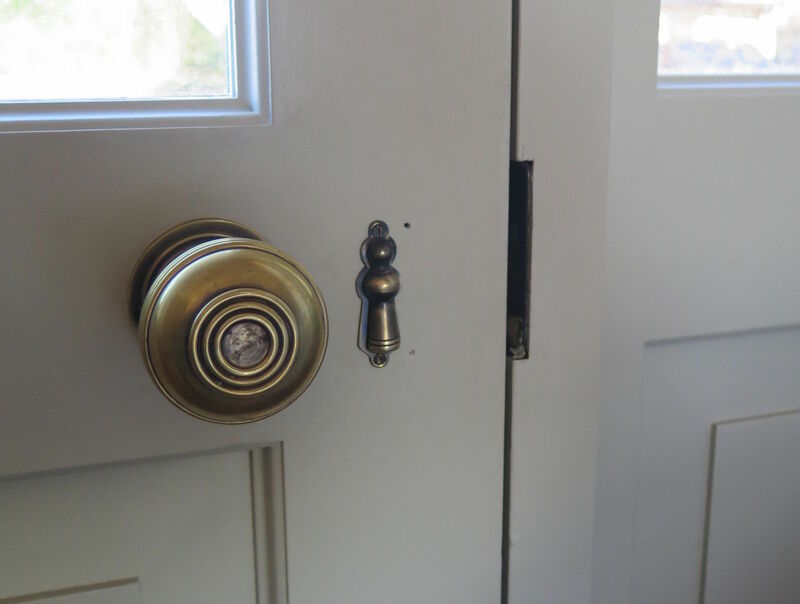 Lever handles can fit on these locks although while a door knob looks perfectly fine set in the from the door edge, lever handles look odd so we don't recommend it. On locks suitable for door knobs, the keyhole, cylinder and bathroom turn will sit next to the door knob at the same height. They are referred to as 'horizontal locks'. Does the fixing method of my lever handles and door knobs matter? It should be little surprise that this can play a factor in the lock or latch you ultimately go for. If your handles or knobs use a fixing method that can be described as “back to back” fixing, it is essential that you choose a case lock or latch case that allows for these back to back bolts to pass through it. You can often simply get away with using standard wood screws instead of back to back fixings, although in our experience the hold is never as good. This is why we always recommend getting the correct lock or latch for your handles and knobs. To eliminate the thoughts of 'will I catch my knuckles this time?' 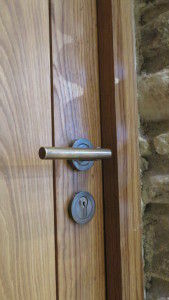 or 'the handle looks weird that far in', it is crucial that your door furniture is the right choice. With the correct lock or latch choice your door will 'just work', and that same satisfaction is also what we wish for you to feel about TBKS: 'it just works'! For our full range of door furniture, please click here.